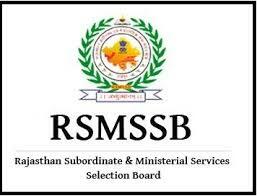 Rajasthan Subordinate and Ministerial Services Selection Board, Jaipur has published Advertisement for below mentioned Posts 2018. Other details like age limit, educational qualification, selection process, application fee and how to apply are given below. i. Senior Secondary from a recognised board or its equivalent examination. ii. "O" or Higher Level Certificate course conducted by DOEACC/ NIELIT. Computer operator & Programming Assistant (COPA)/Data Preparation and computer software (DPCS) certificate organized under Nationall State councilor Vocational Training Scheme. Note: Candidates have to complete the required educational qualification documents before date of typing test. All questions is phase-I will be objective type. Paper will be conducted offline.